History was made yesterday, January 12, 2009, in the beautiful Old Supreme Court Chamber on the first floor of the State Capitol. By one forty-five the room begin to fill with the members of the Joint Republican Caucus scheduled for 2:00 p.m. The air was filled with excitement and anticipation. By the time the meeting was convened, there was 'standing room only' with legislators, family members, staff and news media over flowing the already hot and stuffy room. Senate Caucus Chairman Diane Black (Gallatin) called the meeting to order at about two fifteen. Sen. Jack Johnson (College Grove) called the senate roll and reported 19 members present. Lt. Governor Ron Ramsey (Blountville) asked "How many?" making a point about the increased Republican majority. Sen. Johnson responded, "19" whereupon, the room broke out in applause. Rep. Judd Matheny (Tullahoma) called the roll for the house with 50 members being present. Sen. Black reviewed the selection process mentioning the public interviews. She noted that candidates would not be speaking and that three ballots would be distributed; one for each of the offices: State Comptroller, State Treasurer and Secretary of State. Rep. Jason Mumpower (Bristol) acknowledged that this was an historic occasion (to hearty applause) and pointed out that the process had been open and thorough. While the ballots were being marked, Rep. Mumpower also made note that the only former Republican Speaker of the House was in attendance. Former Congressman Bill Jenkins served as speaker from1969 to 1971, when the balance of members was 49 Democrats, 49 Republicans and one independent. So while Mr. Jenkins was a Republican Speaker, the Republicans were not in control of the body. 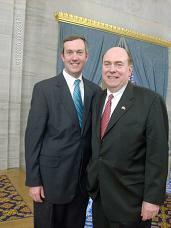 About two forty-five the results were announced: Comptroller nominee is Justin Wilson, Treasurer nominee is David Lillard, and Secretary of State nominee is Tre' Hargett. The full house is expected to vote for these offices at the Wednesday floor session where these nominees will face the Democrat nominees and present officer holders, Comptroller John Morgan, Treasurer Dale Sims, and Secretary of State Riley Darnell. The clerk will call the roll and each house member will respond with the name of the candidate he or she supports. The winner for each office will have to receive 50 votes. The highlight of today will be the "SHOW DOWN AT HIGH NOON" when the 99 members of the State House will select their Speaker and Speaker Pro Tem for the next two years. Stay tuned!! If you cannot attend, you can watch the festivities on your computer here and choose House of Representatives.